This is a detailed itinerary for 24-hours in Frankfurt if you happen to have a layover or are stopping on your way through. One day in Frankfurt is enough to see lots of the city and do some cool things. If you're staying more than 24 hours in Frankfurt then have a look at some great day trip options. 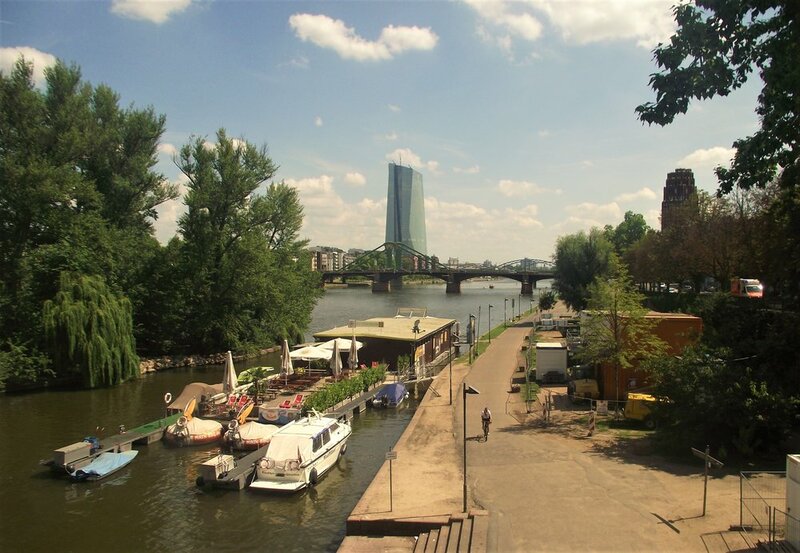 Frankfurt is famous for finance and business, including the European Central Bank, and… that’s about it. But its location in the middle of Europe and its huge airport (third largest in Europe) make it a busy thoroughfare for travellers. I lived in Frankfurt for two years and I’m not about to claim it should go on your list of top 10 cities in Europe. However, there are more than enough things to do in Frankfurt to keep you occupied for a day or two as a stopover on your way North, South, East or West through Europe. With some help from Max (a Frankfurter born and bred) I have created the ultimate itinerary for one day in Frankfurt. Frankfurt is home to about 800,000 people and has a very compact city centre. You can walk from one side to the other in about half an hour. Frankfurt, in true German style, has excellent public transport in the form of buses, trams and underground. A day ticket will cost €7.20 but if you are any more than one person purchase a group day ticket for €11.30 which is valid all day for up to five people. The RMV website is available in English, as are all the ticket machines. Sundays are a day of rest all over Germany. This means no shops or supermarkets are open. However, most cafes and restaurants are open as usual. The cheapest and easiest way to get into Frankfurt city is with the S-bahn (train system). Simply follow the signs, purchase a ticket at one of the machines and take the next train heading to Hanau or Frankfurt Hbf (this is short for Frankfurt train station), it will be S8 or S9. Both trains stop at all the main stations in the city centre but Hauptwache is the most central and best place to switch to the U-bahn (underground). Because the airport is considered outside the city it costs extra. The journey to town costs €4.90 and takes around 15 minutes. The trains leave roughly every 15 minutes. A taxi between the airport and the city centre usually costs around €40 using the meter. Literally translates to 'Old Opera', this beautifully restored building stands in a grand square. Check here for performances. 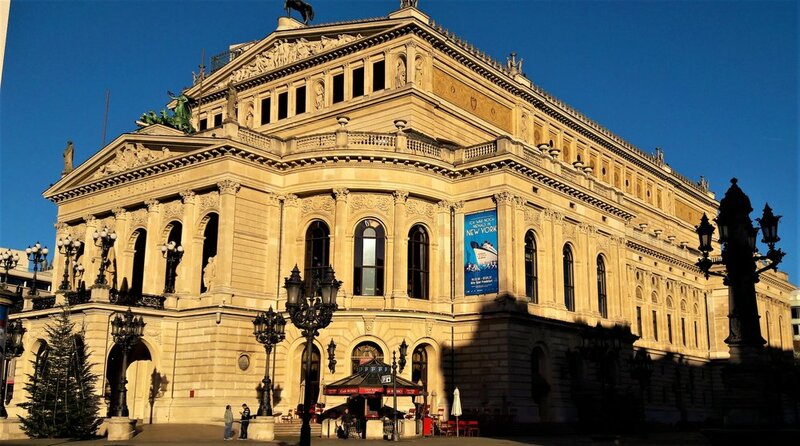 Even if the opera is not your thing, it is definitely worth a look and is a good place to begin a walk through Frankfurt. From there walk or take the underground to Hauptwache. This square is the hub of Frankfurt. To the South is St Catherine's church and the old Hauptwache building which used to be a guard house and a prison and is now a busy cafe. From the East side of the square runs the Zeil, the main shopping street where you'll find all the normal high street shops. At the start of this street is Galleria Kaufhof, a giant department store. Don't worry, I'm not suggesting a shopping trip. Instead, if you go up to the top floor there is a cafe/restaurant with great views over the city. You don't have to buy anything to go out on the balcony and enjoy the views but the cafe is reasonably priced. Turning right off the Zeil you'll come to a large hall which houses an excellent food market. From flowers to fruit, fresh fish to coffee, this is a great place to wander and snack or make a lunch stop. 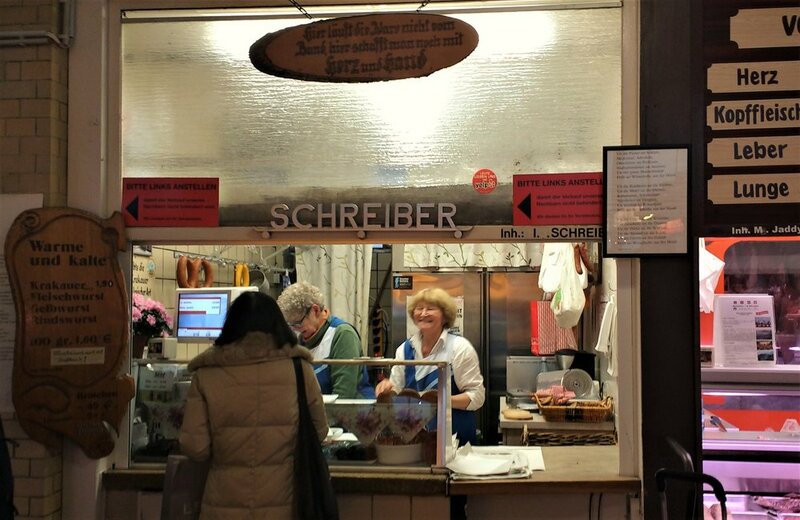 Check out the little hole in the wall (Metzgerei Schreiber) for some of the best sausages in Frankfurt- you'll see the long queue. From the Western exit of the Kleinmarkthalle turn left and continue walking until you pass the Alter Nicolai Church. A little further down is the old centre of Frankfurt. This is where you'll find the Chinese tour groups and anyone else looking for that German old town with the cute houses - you know what I'm talking about. In this square is the city hall and, if you come during December, the bustling Christmas Markets. Behind the medieval houses is the grand Frankfurt Cathedral which is free to go into. South of the Römer is the River Main (hence the full name Frankfurt am Main). It's not exactly a picturesque European river but it does make for a nice stroll on a sunny day. There's also plenty of good people watching to be done. The first bridge you come to is Eiserner Steg or 'Iron Bridge' and is the oldest pedestrian bridge in Frankfurt. From it you can see down the river to the impressive structure that is the European Central Bank. The bridge is also adorned with locks for those who are romantically inclined. On Saturdays a flea market sprawls along the South bank with all sorts of interesting and odd things to be found. If you've lucked out with a sunny day then the Palmengarten is a great place to wander, picnic and enjoy a huge variety of plants. 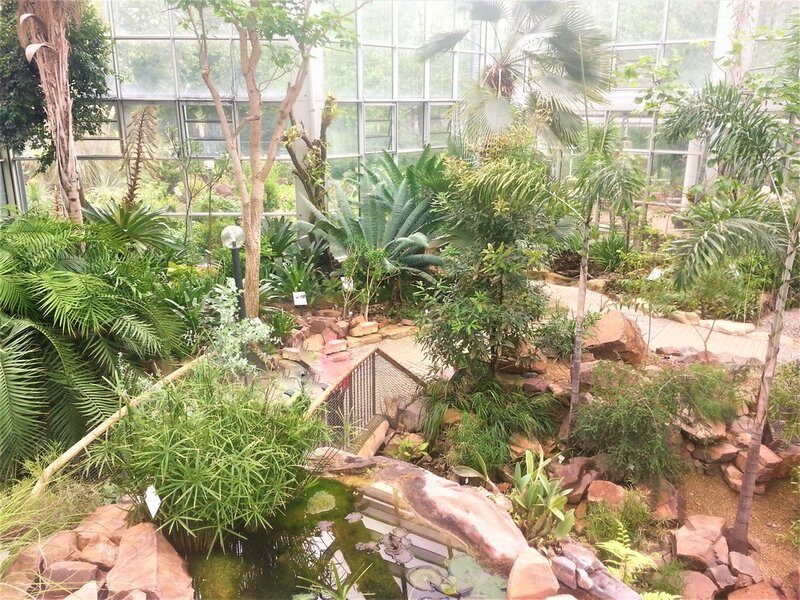 I've only been there in the rain with a 120 seven-year olds but the cactus houses were great and the gardens looked like a gorgeous place to enjoy the sun. Cafe Siesmayer next door, with views into the gardens, has a brilliant selection of cakes for an afternoon snack. If you're stuck with a rainy day there are still plenty of things to do in Frankfurt. Try heading to a museum as there are plenty in Frankfurt. These include; Städel Art Museum , Museum of Modern Art and Goethe House. Not being a museum person myself, I haven't checked any of these out but have heard good things. I can however, recommend the Senckenberg Naturmuseum which has great natural history exhibits and a good cafe. Green Sauce (Grüner Soße) A cold sauce made from yoghurt, creme fraiche and seven herbs grown all around the Frankfurt region. Handkäse- Not going to lie, I find this disgusting but Max loves it. Stinky cheese marinated in vinegar and onions served with bread. Applewine - Fermented apple juice. Similar idea to cider but without the sweetness. It comes served in traditional clay jugs called 'bembles'. You can drink it pure or add some sparkling water. If you've had a few apple wines and want to continue your evening, head to the Klappergass in Sachsenhausen. In these cobbled streets you'll find a variety of pubs and bars for anything from a quiet drink to a disco. Not the classiest area of Frankfurt but a great place to meet people and have some fun. Good Food Lokalbahnhof (Südbahnhof) €14.40 per person not including drinks. A bit on the expensive side but the food is worth it. Cafe Bar Celona (Hauptwache) €11.95 per person including a small orange juice. Great location and good selection of food for the price. Cafe Merianbad (Merianplatz) €13.80 per person not including drinks. Apparently the longest brunch buffet in Frankfurt, including make your own crepes and waffles. They also do brunch on weekdays. 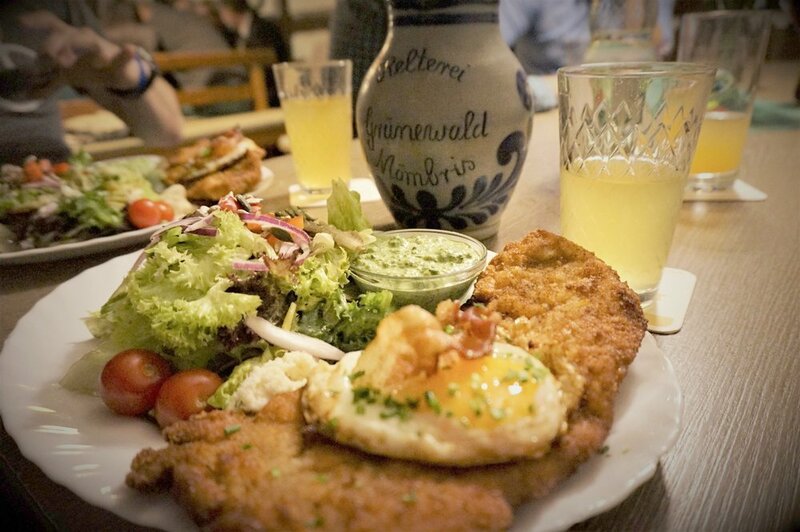 Cafe Bohne (Bornheim Mitte) €5.90 per person not including drinks. This is not a buffet, you simply order as much of what you want from the selection on the menu. 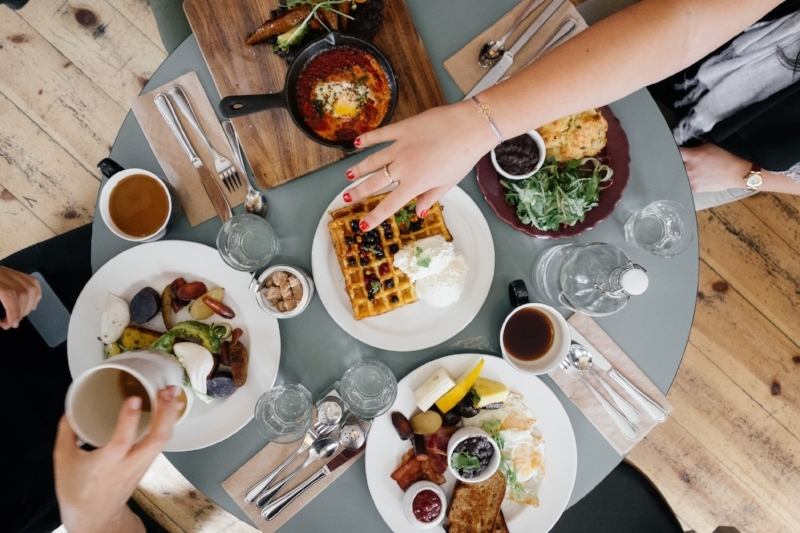 The food is not as good as the other places but it's a great budget option. So now you know all the best things to do in Frankfurt in 24 hours! When you find yourself flying or driving through Frankfurt (which most people in Europe do at some point) take some time to stop and see the city! For budget travellers Five Elements hostel has everything from dorm rooms to an entire studio apartment. They have a bar and buffet breakfast for €6.50 (or free if you stay 3 nights). It's centrally located and can easily be reached from the main train station. Check prices here. If you're looking for a gorgeous boutique hotel Libertine Lindenberg offers stylish rooms, an organic shop, guest kitchen, full restaurant services, a gym and bike and Vespa rentals! Check prices here. If you prefer a nice apartment check out Airbnb and get a €28 discount on your first stay! Older PostPlastic Free July While Travelling: How Did it Go?